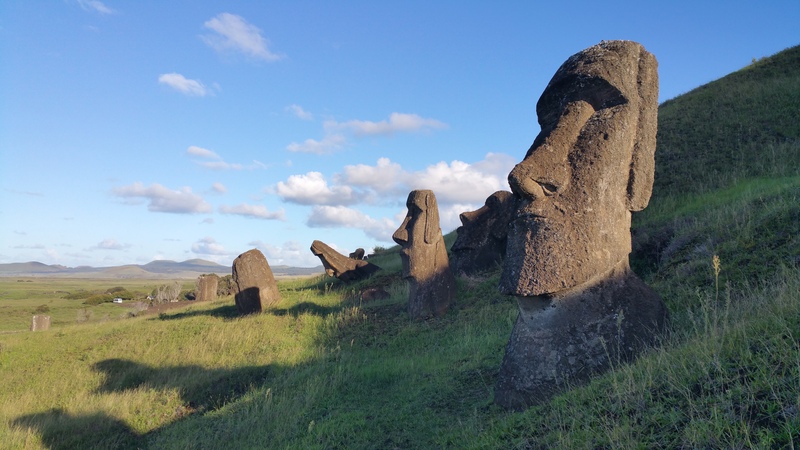 There is so much more to Easter Island than all the moai statues—the cycling, the hiking, the beaches. 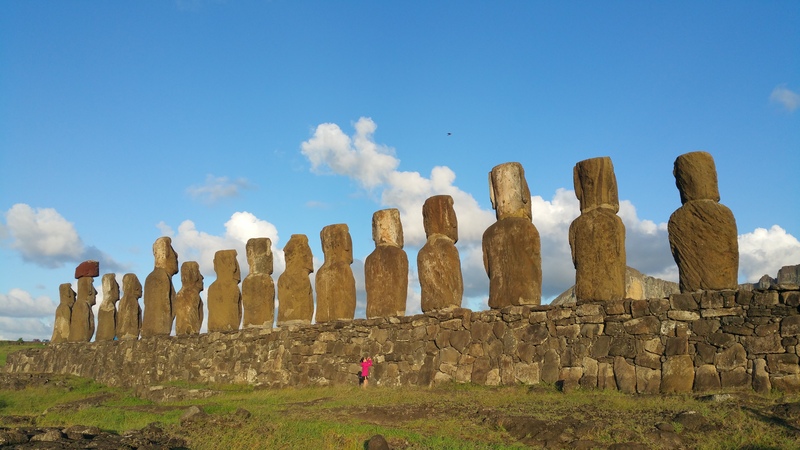 In my post about Easter Island On A Budget, I lay out all the logistics and costs associated with the trip, but in this post I will highlight all the activities we enjoyed. It wasn’t until around 4pm when we were finally free to explore the island. 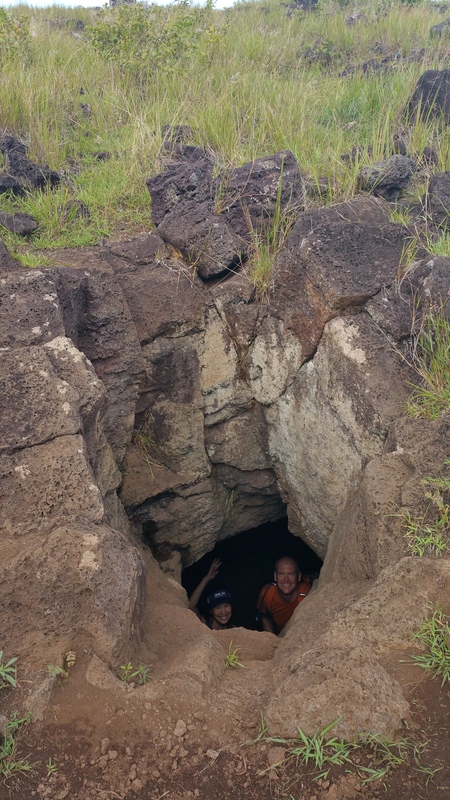 Our plane landed around 2pm, we walked to Camping Mihinoa from the airport, and we “checked in” to our tent. 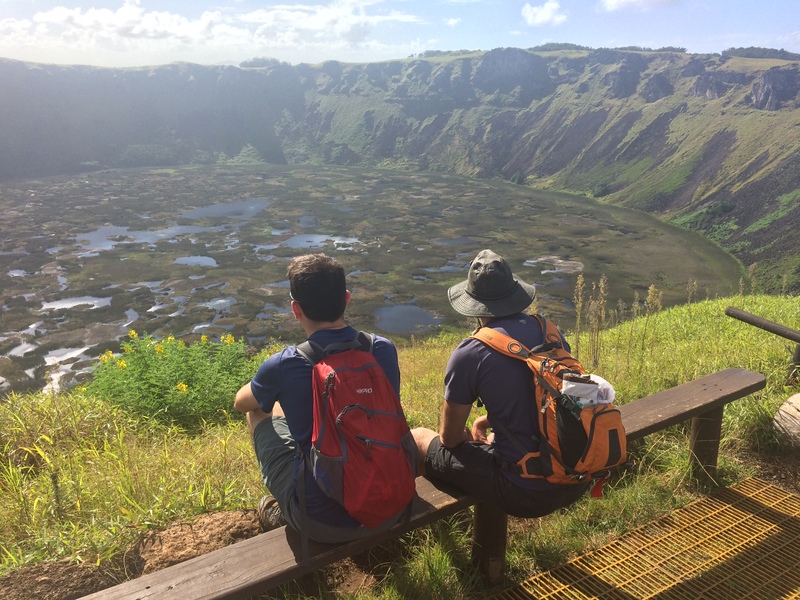 The hike up to Rano Kao, the extinct volcano that is now a marsh, wasn’t too far away from the campsite so we opted to check it out. No words can explain the majestic sight one sees when gazing into the crater from the rim of the volcano. 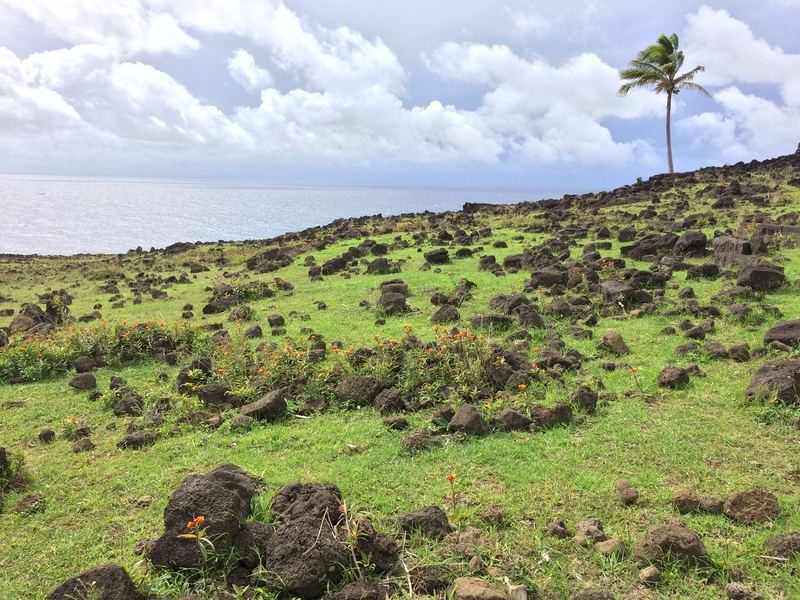 Along the crater was the ancient Orongo Village, overlooking the ocean. 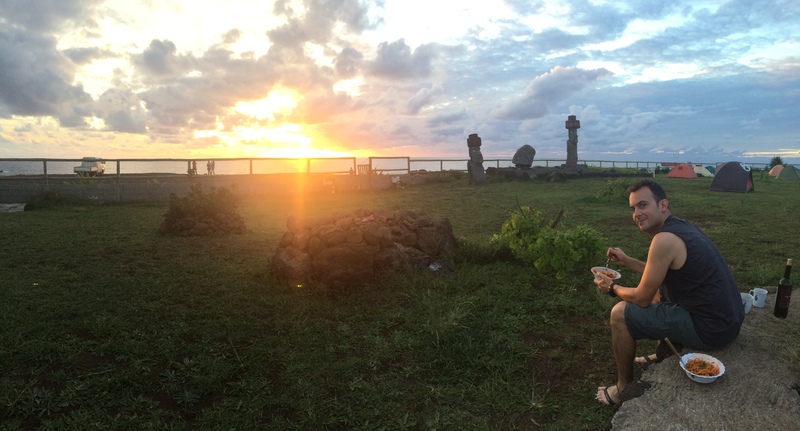 We returned to camp just in time for me to prepare dinner, and we watched the sunset over the ocean as we ate from our campsite. 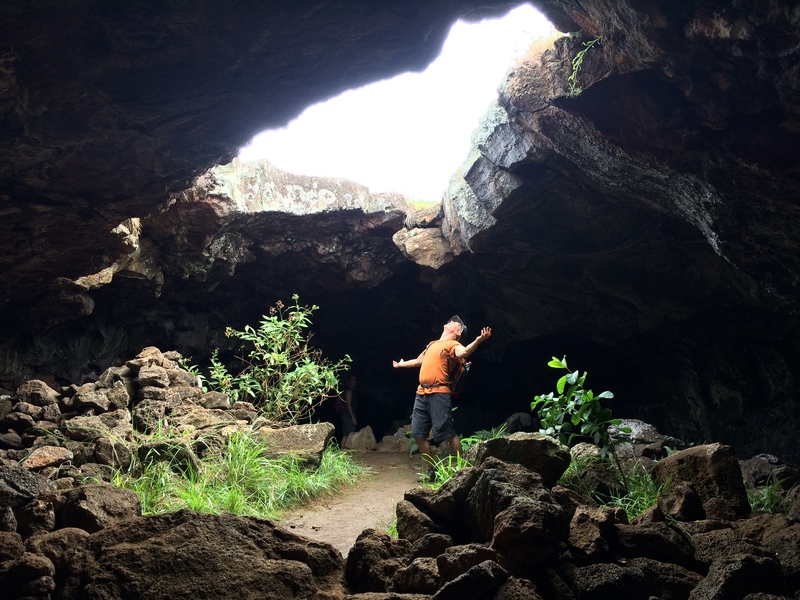 Karl, Chris, and I rented bikes and set out from Hanga Roa to explore the quarry of Puna Pau, the moai set of Ahu Akivi, Easter Island’s highest peak Maunga Tere Vaka, the caves of Ana Te Pahu and Ana Kakenga, and the moais Ahu Akapu and Tahai on our return. Although only 17 km round-trip, a good portion of the ride was on gnarly dirt paths. 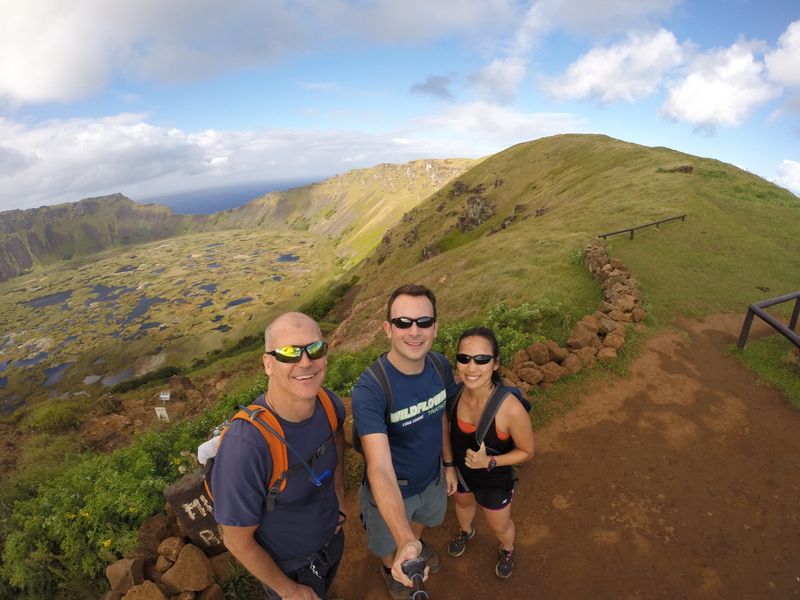 The hike up to the highest peak was also steep and long, and we were exhausted by the end of the day. 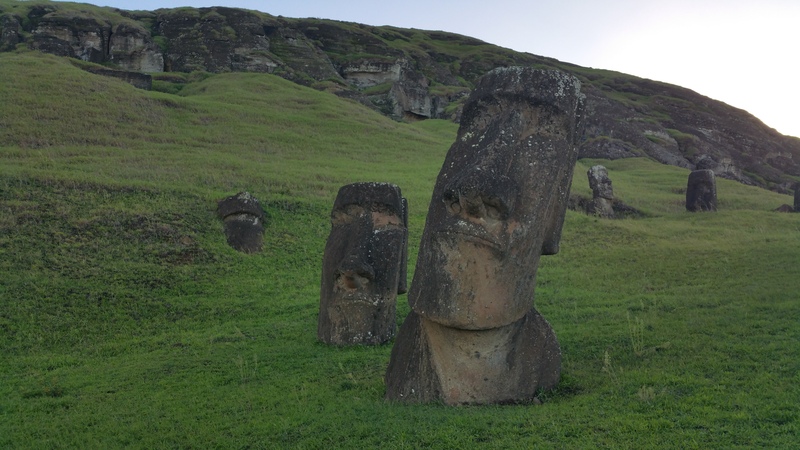 The quarry of Puna Pau is the home to crimson-colored rocks, contrary to the rest of the gray rocks the moai were carved from. 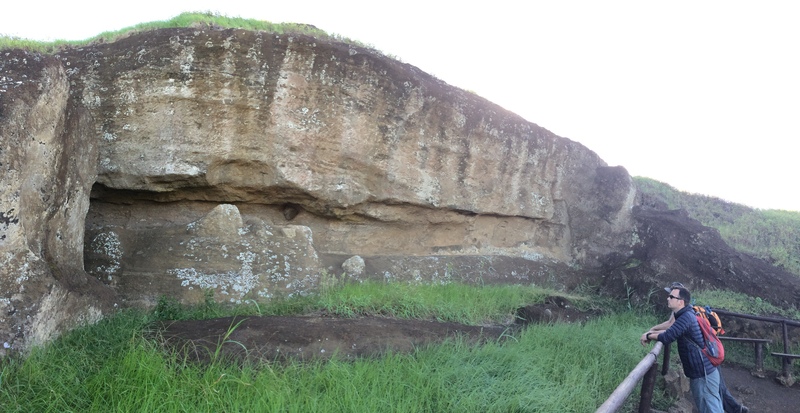 It was here where the people of Rapa Nui dug up and carved the “top-knots” or “hats” seen on many of the statues. 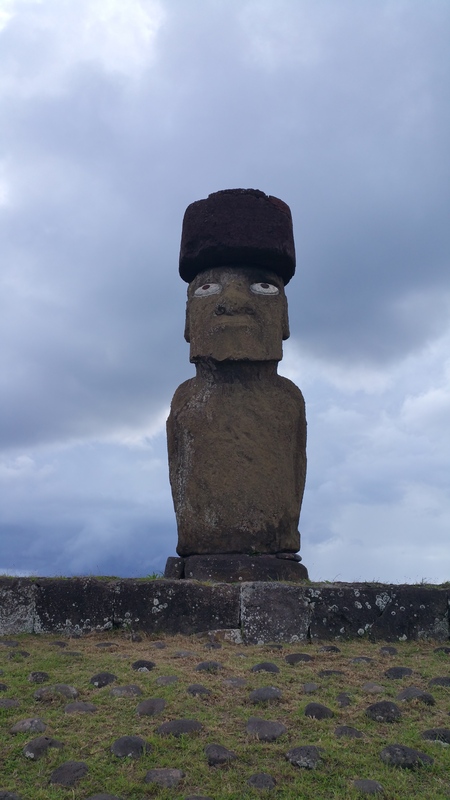 A number of these hats lay strewn about at Puna Pau. These hats never made it to their destination. 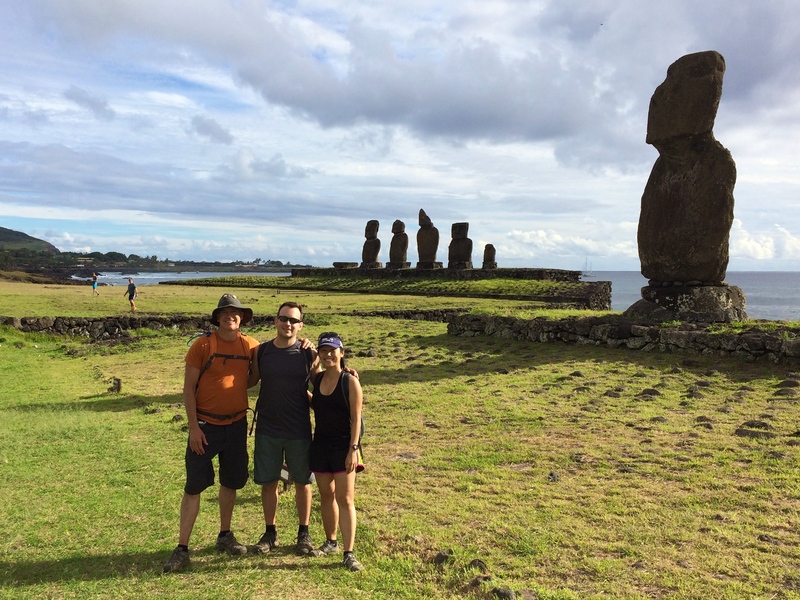 Next was Ahu Akivi, where we took a quick photo and lunch break. 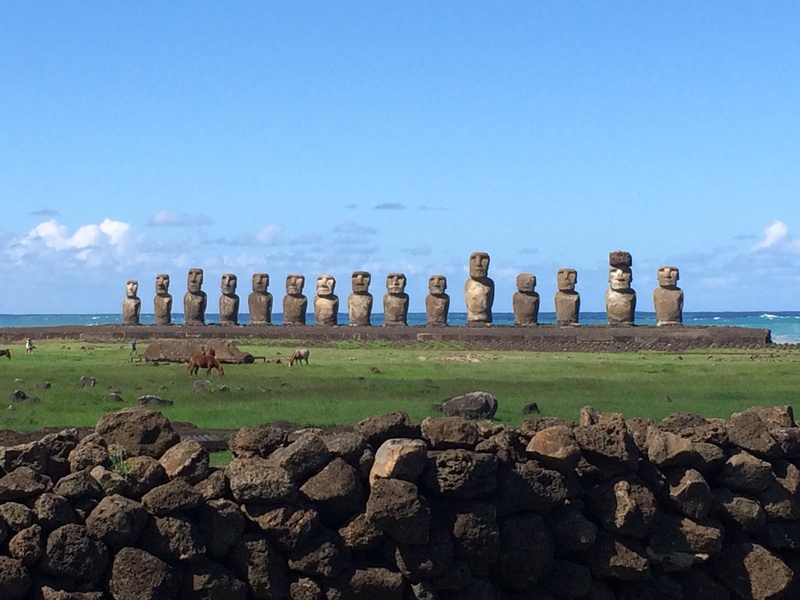 These were interesting to me as this set of moai were inland whereas the other rows of moai were coastal. 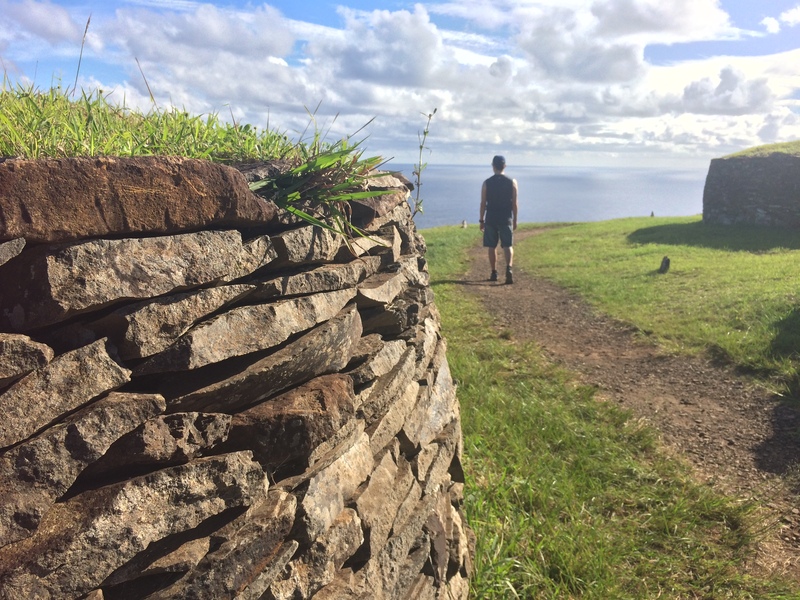 Not far from Ahu Akivi was the trail leading up to Maunga Tere Vaka, the highest peak on Easter Island. 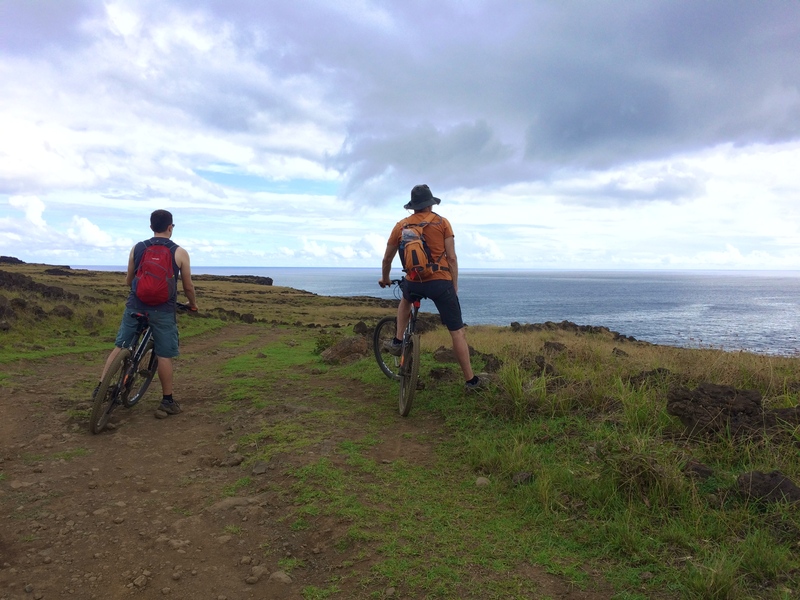 We biked up a steep, gnarly portion of the trail before we finally decided to park our bikes and hike the rest. From there we were able to see the ocean all around us. 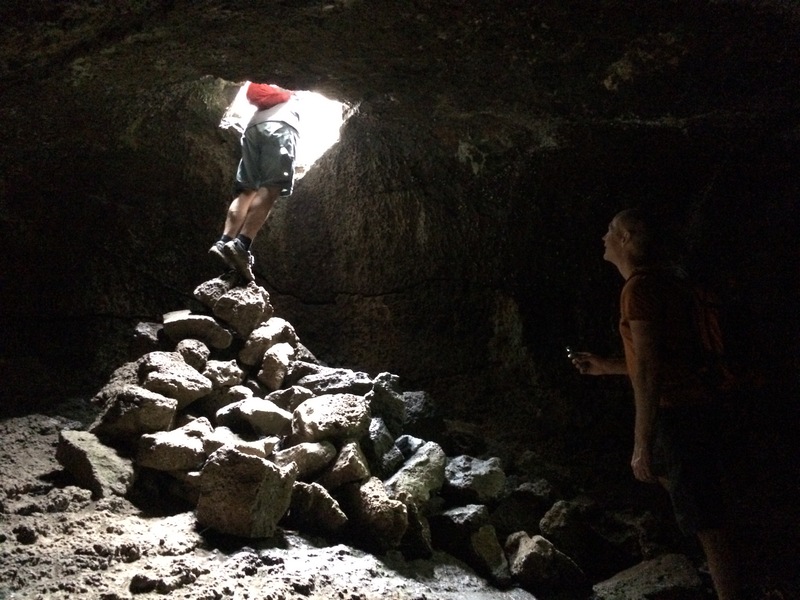 After the hike we remounted our bikes and descended to Ana Te Pahu cave. Not far from Ana Te Pahu we continued to a slightly hidden, gorgeous cliff and sea view, which I believe was Ana Kakenga. 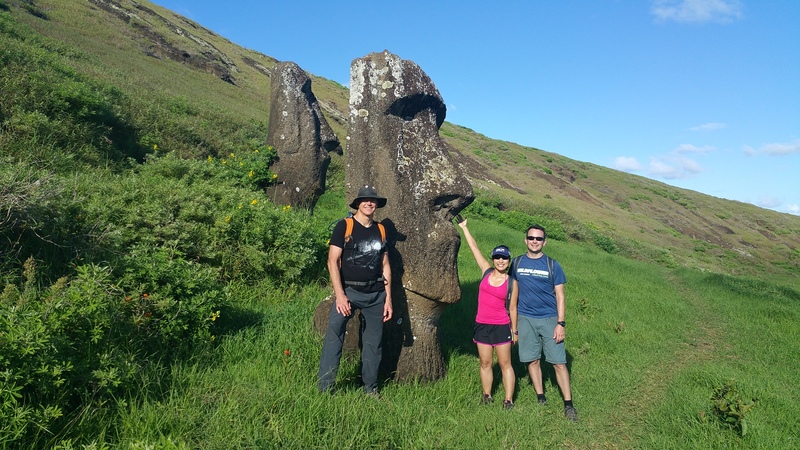 And finally, upon returning to the town of Hanga Roa, we finished our self-guided cycling tour with the moai set at Tahai. 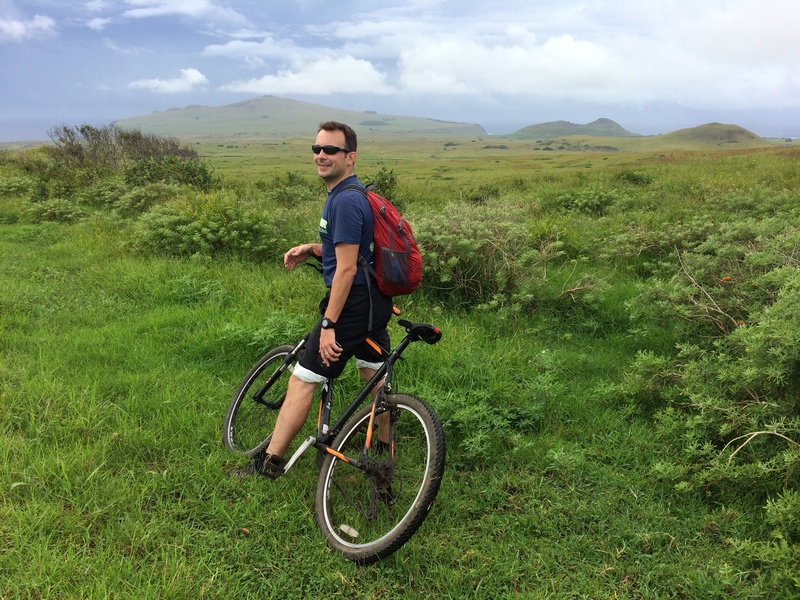 With slightly sore legs and sore butts, Chris and I mounted our bikes once again and set out for Anakena Beach, which took about an hour of pedaling. The probability of rain was high, but we didn’t care. The bike ride was gorgeous. 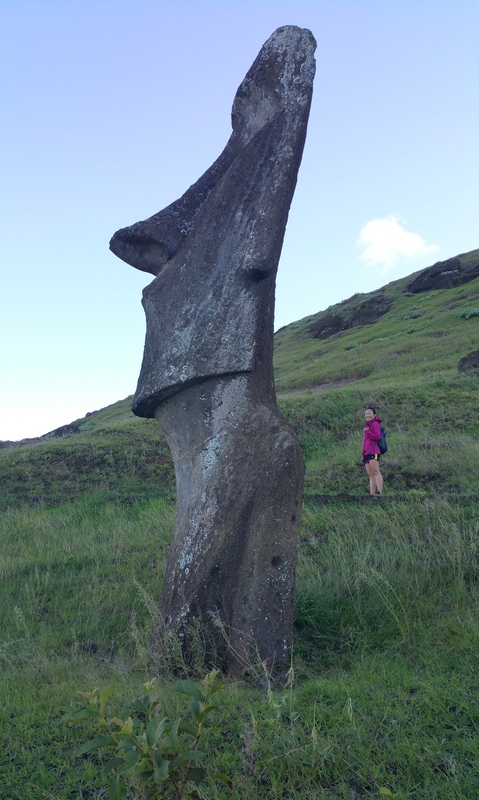 Anakena Beach also had a set of moai. 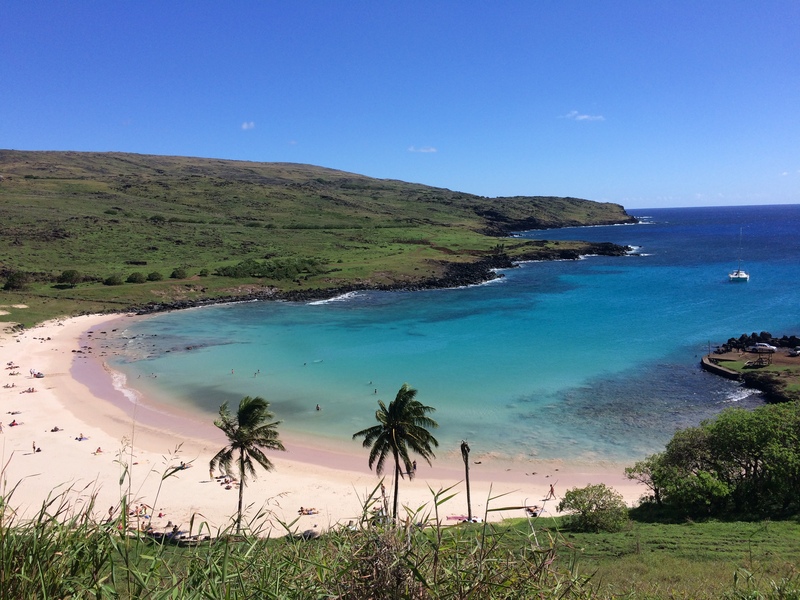 We spent at least an hour at this gorgeous beach. From the beach we hiked along a mostly-eroded path to Hanga O-Teo and back. 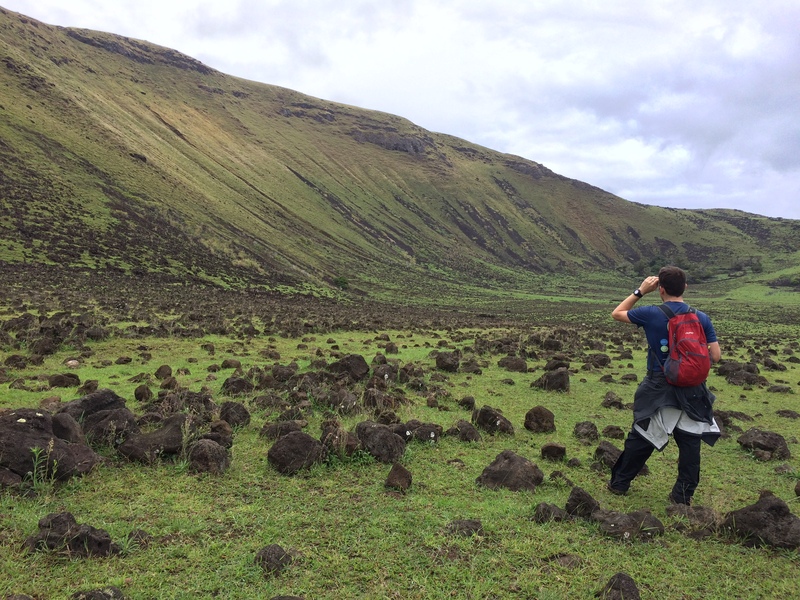 This hike isn’t even printed on some maps, and no one talks about this hike, which gives it a reputation for pure remoteness. And boy, was it remote. There was not another soul in sight. 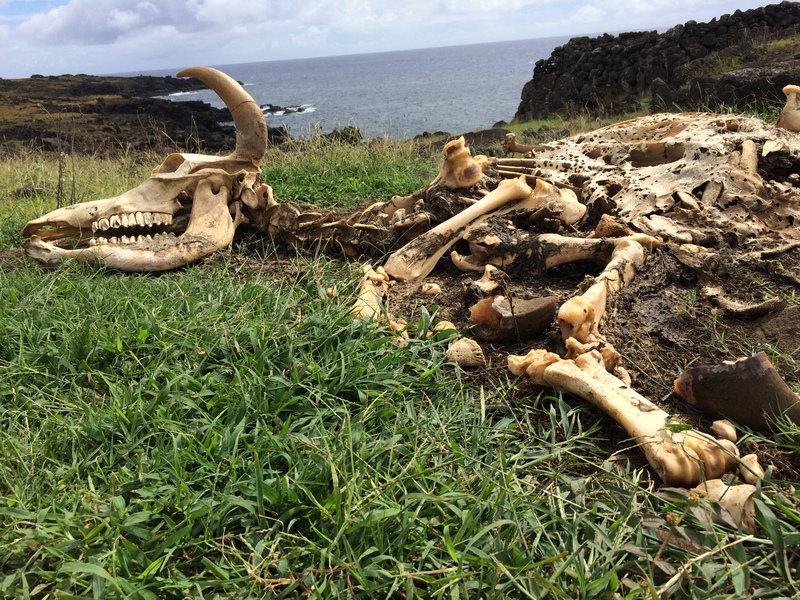 We even stumbled upon a complete, untouched skeleton of a cow. 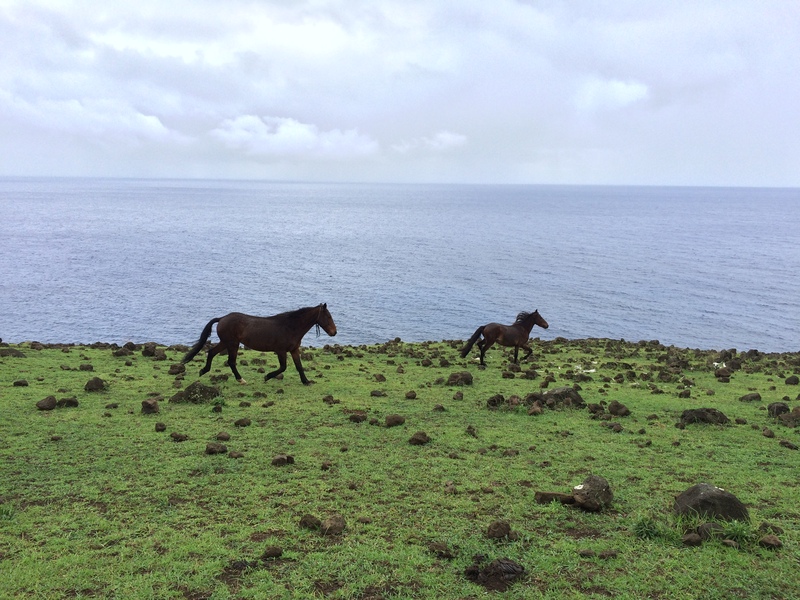 There were wild horses everywhere. 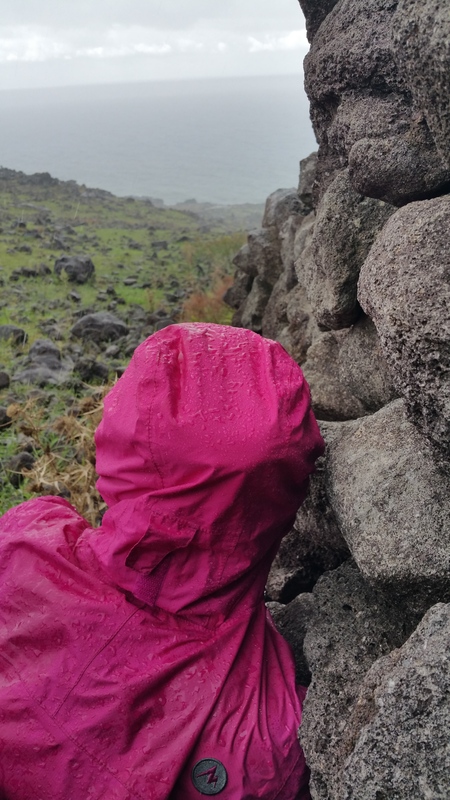 We even got rained on a couple times, but fortunately there were stone walls we huddled up against for shelter. 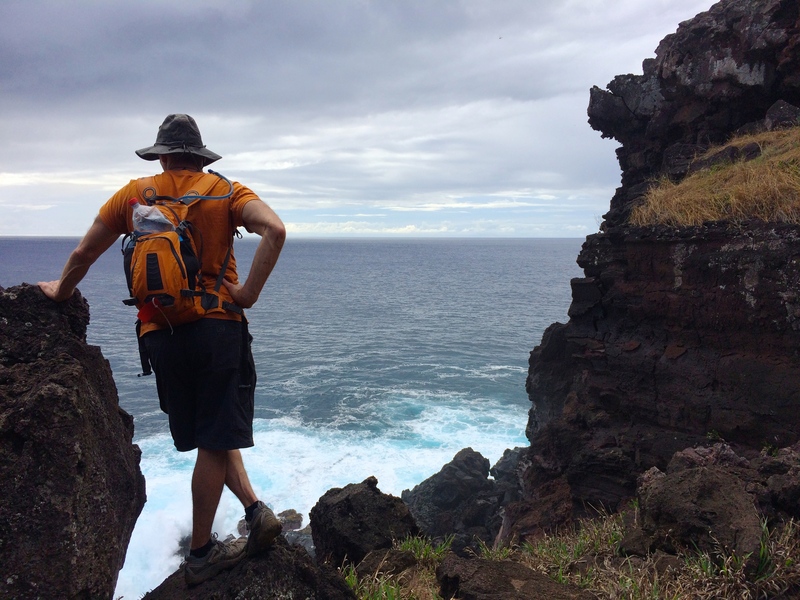 We hiked until we saw a lone house in the distance, equipped with camping tents. 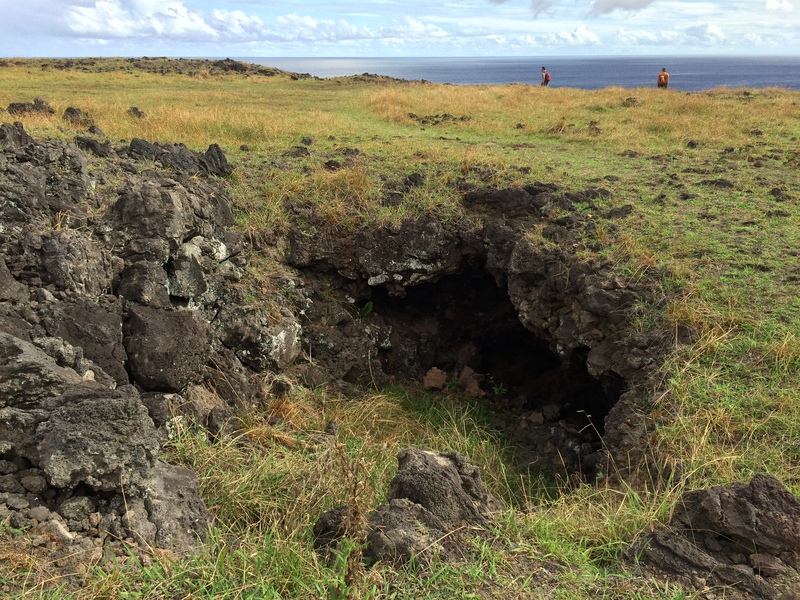 It was situated along the beach, beside the exaggerated slopes of the volcano. From there we backtracked to Anakena Beach (about 3 hours round-trip), where we retrieved our bikes and pedaled back to Hanga Roa (about another hour). We even managed to get dumped on by a brief storm during the steepest climb up the road. Fun times! 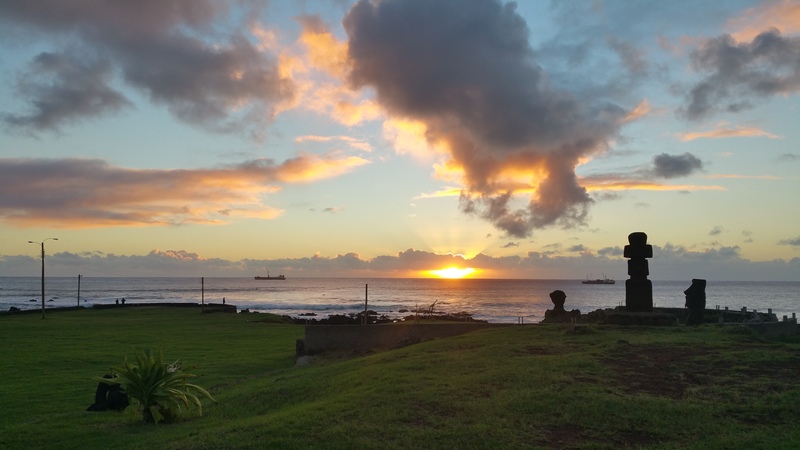 Thanks to the strange time zone, the sun rises late at Easter Island in the autumn. 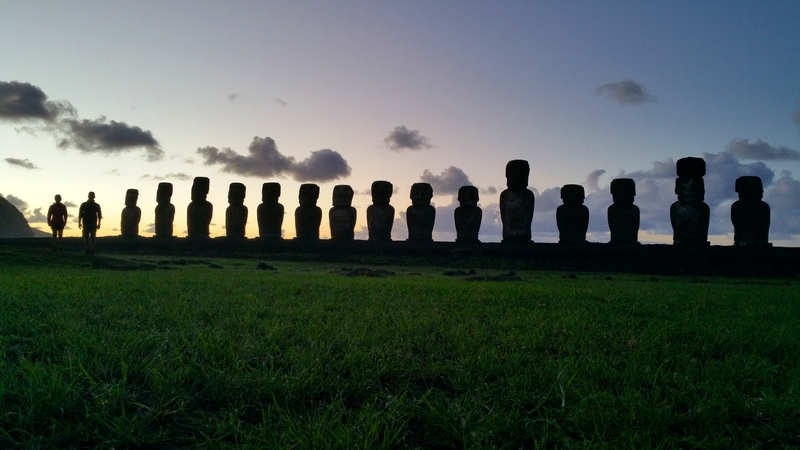 We awoke relatively early to catch sunrise at 8:41am at the most dramatic set of moai, Ahu Tongariki. It was easy to squander away an hour there, snapping myriads of photos every minute as the lighting changed. 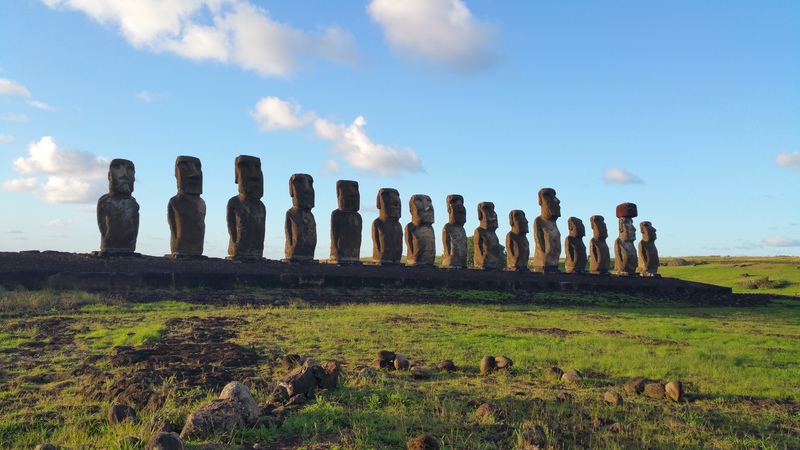 The backs of Ahu Tongariki. 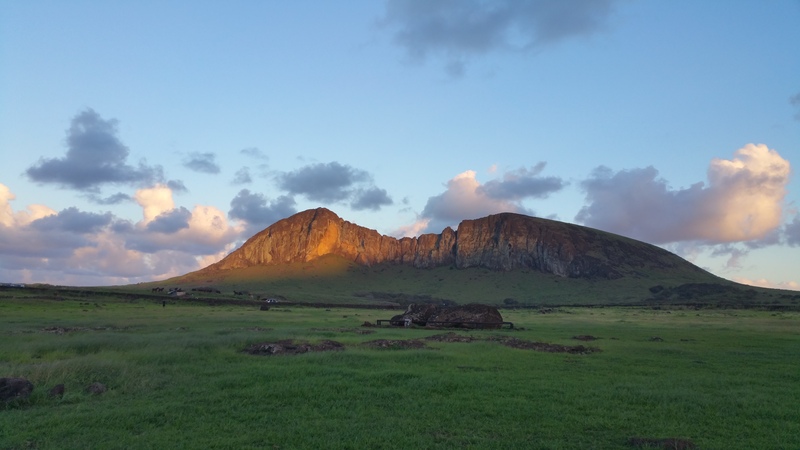 After we spent enough time at Ahu Tongariki, we continued to perhaps what was our favorite site on Easter Island: Rano Raraku, an extinct volcano from which all the moai were carved and distributed from. 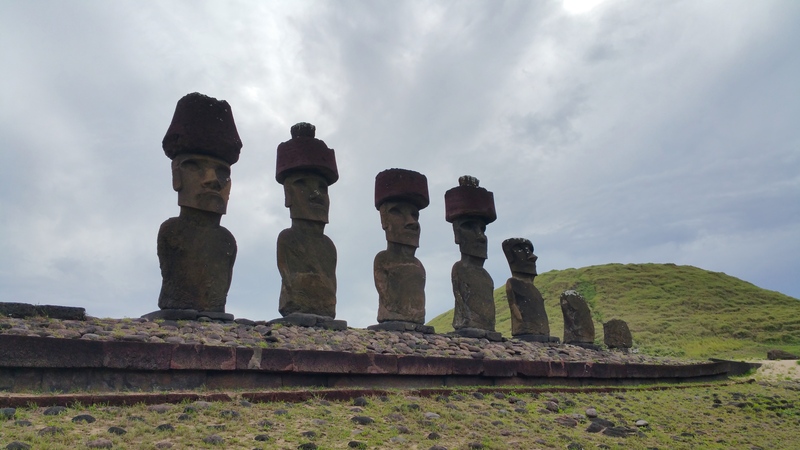 Dozens of moai heads lay scattered across this volcano, most in its upright position, and some face down. 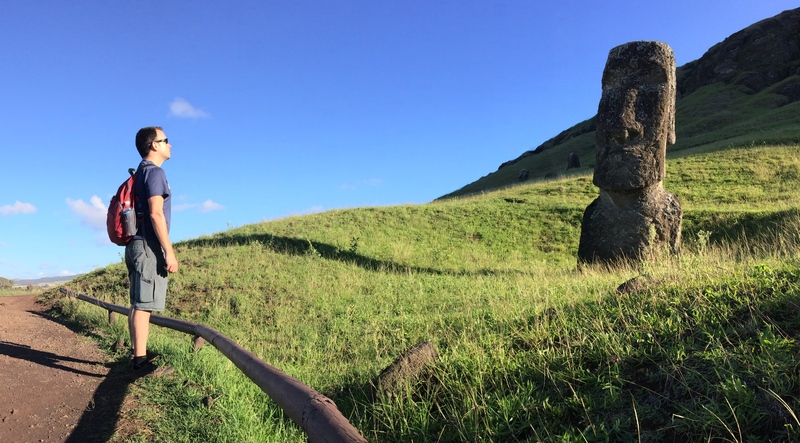 There were even some still carved in the rocks in incomplete form. 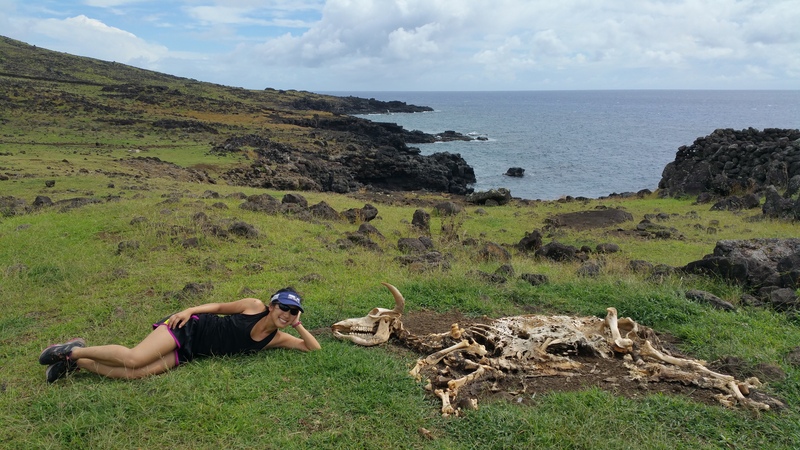 A short hike to the rim of the volcano exposed a storybook-scene: blossoming trees, vibrant green grass, wild horses, and a pristine lake. 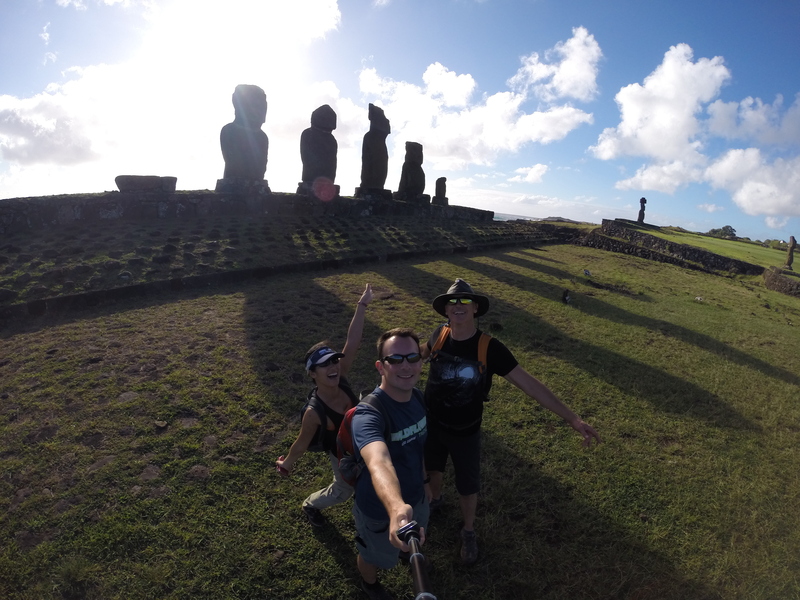 The dirt path along the rim led us to a handful of more moai that we could get up close with. 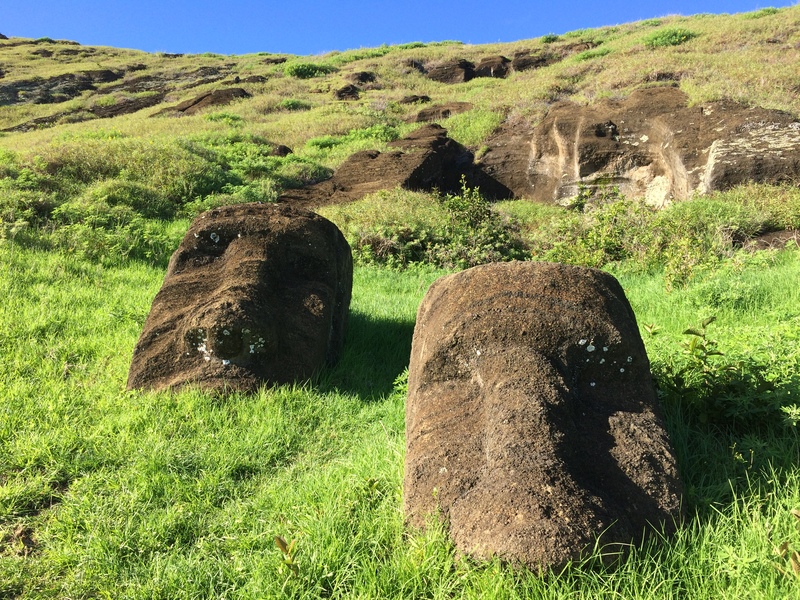 Once we observed all the moai at Rano Raraku, we returned to Anakena Beach to go for a swim in its crystal clear waters. 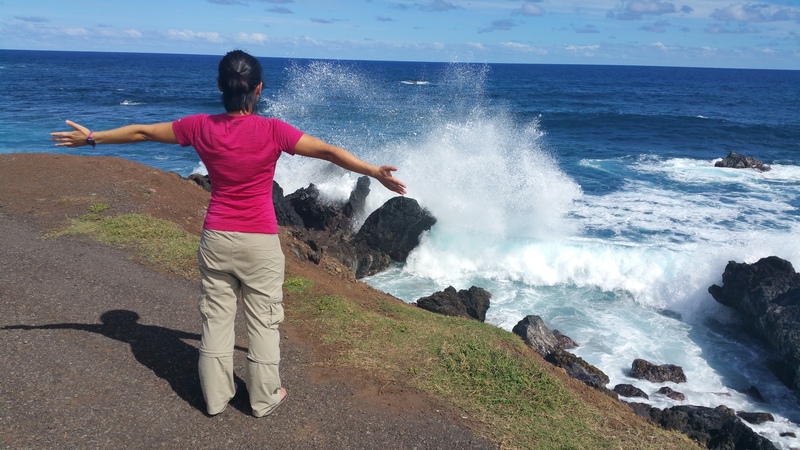 Before returning the rental car, we relished the scenic coastal drive along the southern shores of the island. 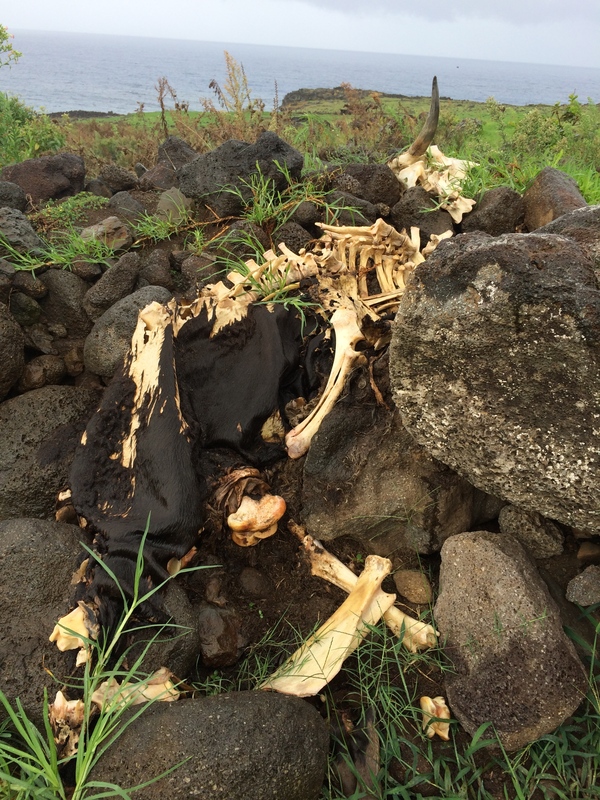 Wild horses and cows were plenty, along with the dramatic, powerful waves splashing against the lava rocks. 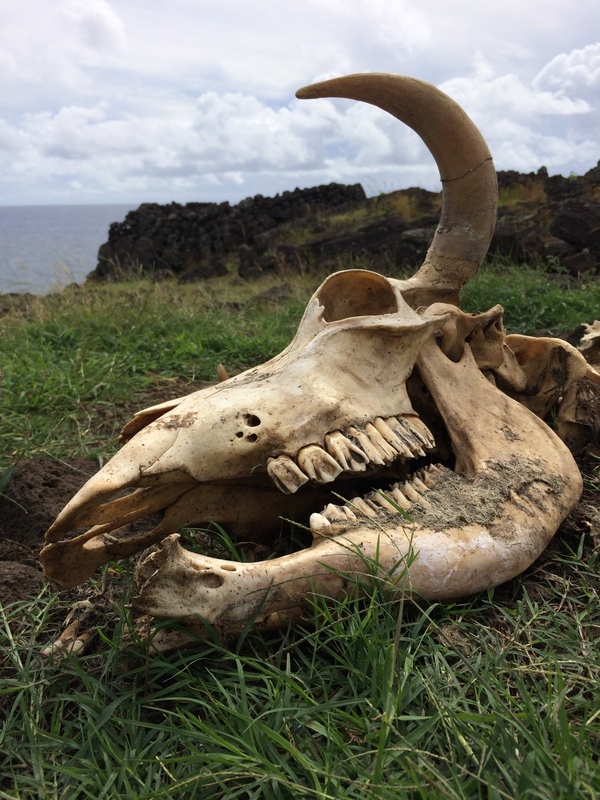 Because the conditions were not favorable for scuba diving, we spent our final day on Easter Island revisiting our favorite site nearest Hanga Roa: Rano Kau. After a big breakfast we grabbed our gear for our last day of hiking. 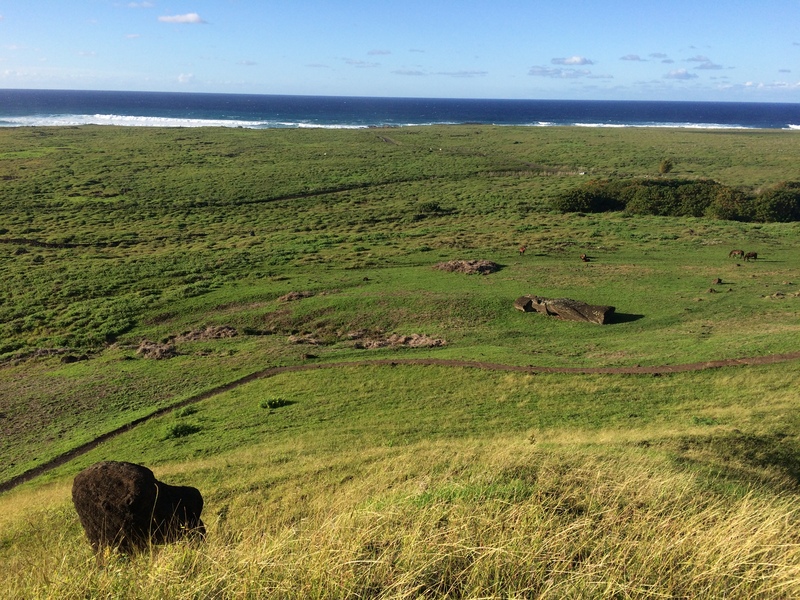 Unlike the previous time we hiked to Rano Kau, the winds were stronger and the clouds were lower. The swaying grass, and the swift clouds and its shadows created a stunning visual experience. 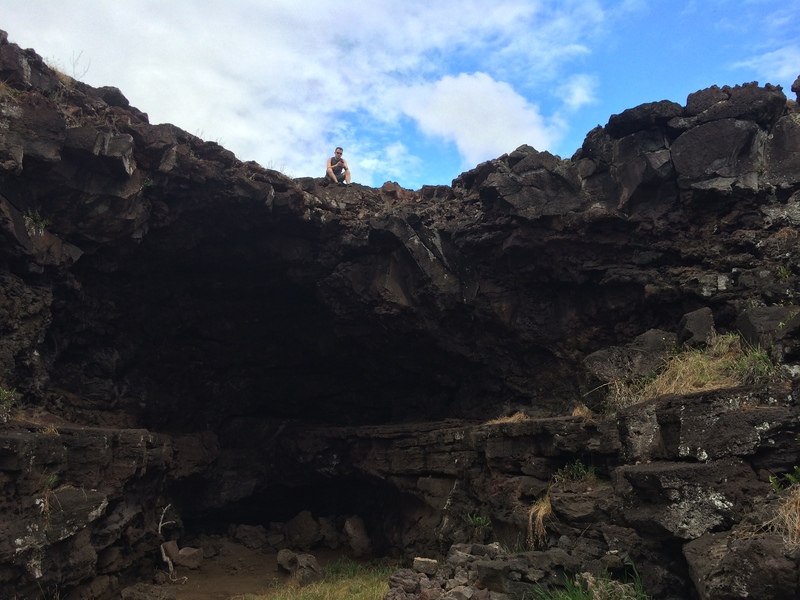 Having so much extra time on our hands, we wandered off the trail along the coast and discovered an indescribable lava tube. 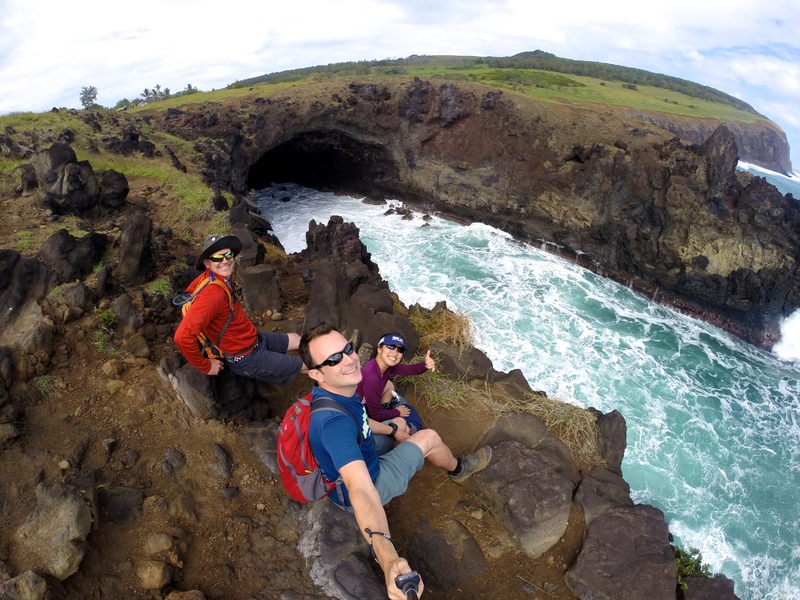 We watched Mother Nature’s powerful waves rip and crash onto the massive lava rocks. We had to tear ourselves away from this coastal gem; otherwise we would’ve remained there for hours. From there we stumbled back into town, grabbed some snacks, and returned to our hotel for a brief break. 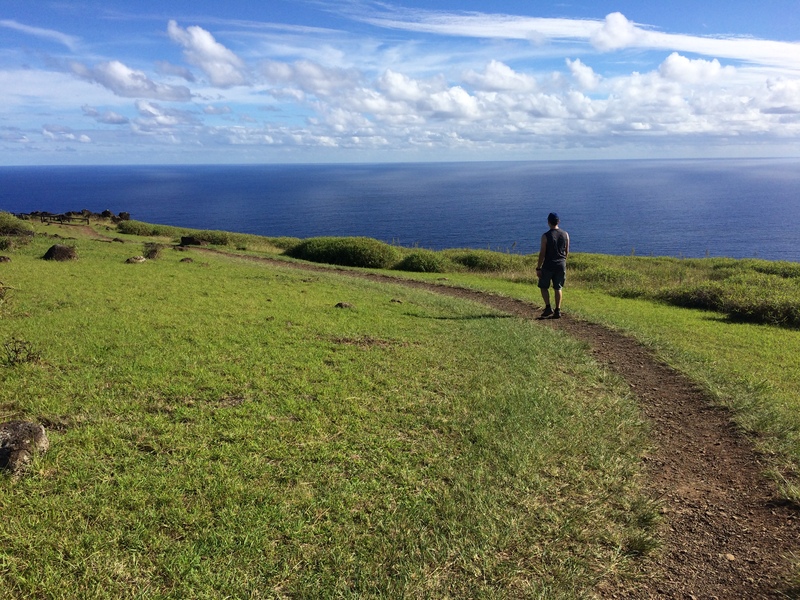 Then we set out again for Tahai in the late afternoon. 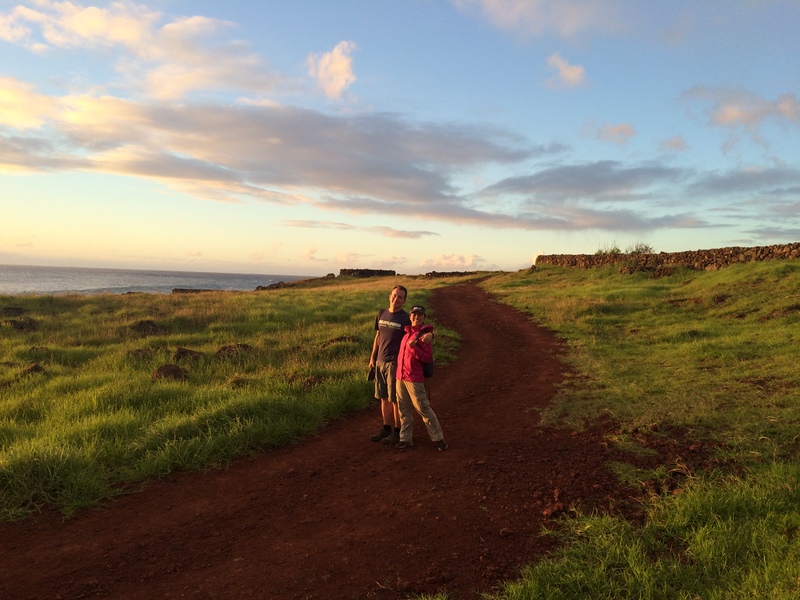 And we couldn’t believe that the colors of sunset were natural—the lighting was just incredible. That evening we dined at a restaurant along the beach for our final night. 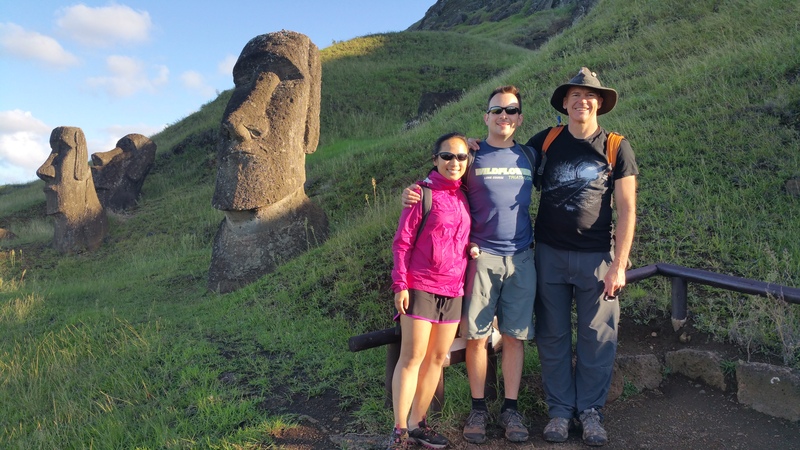 Because I had prepared all our lunches and dinners during our entire stay at Easter Island, eating out was a fantastic way to end the trip. 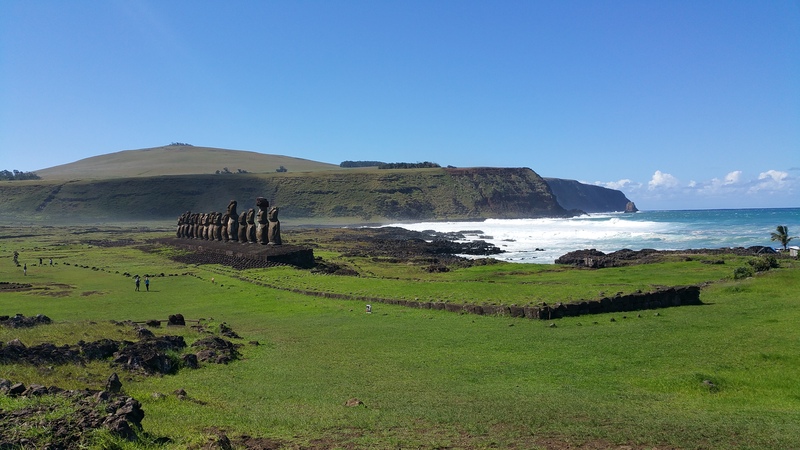 Sleep in, pack, walk around a bit more, and head back to Chile mainland. 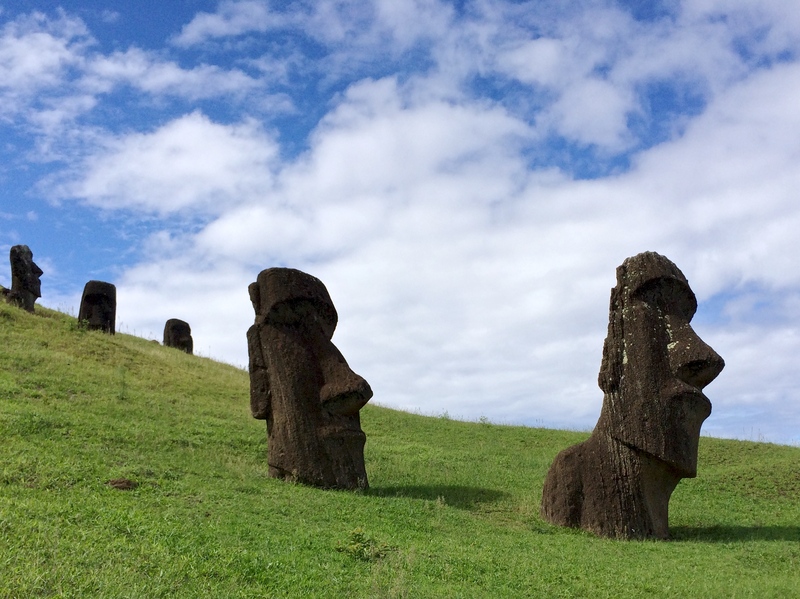 Thanks Easter Island! No words can describe how memorable you were! Thanks Andre. 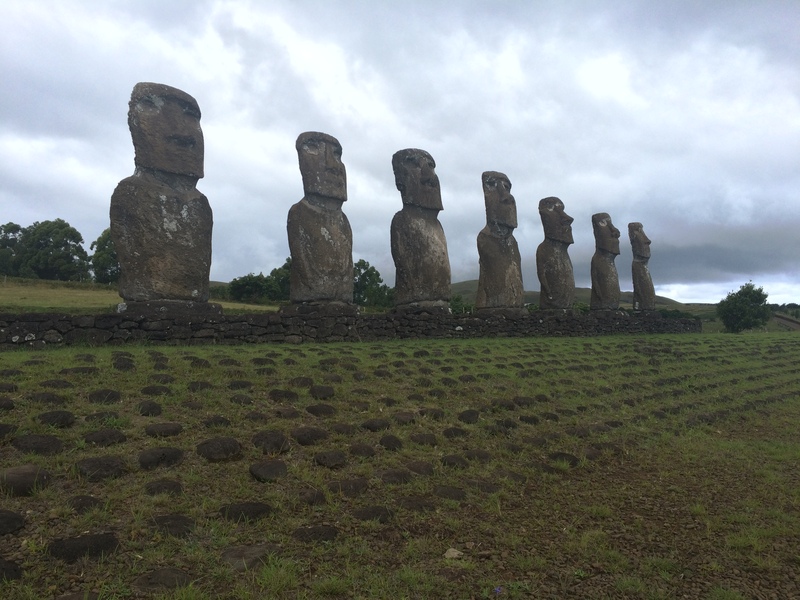 I’ve been to many cool places and I must say Easter Island is definitely one of the coolest places I’ve been to.